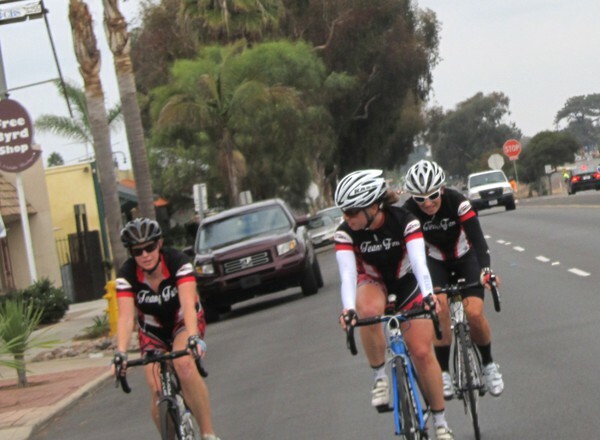 A delightful group of 18 ladies showed up with their road bikes early last Sunday morning to hit the coast south in search of some long miles. 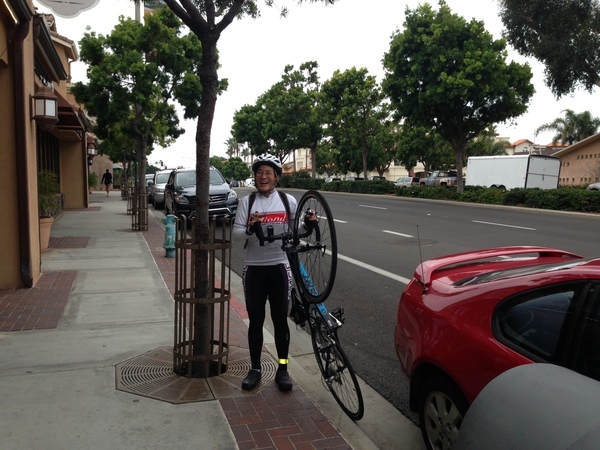 The plan was to keep a challenging pace, but not push anyone past her breaking point, and finish the longer ride strong. 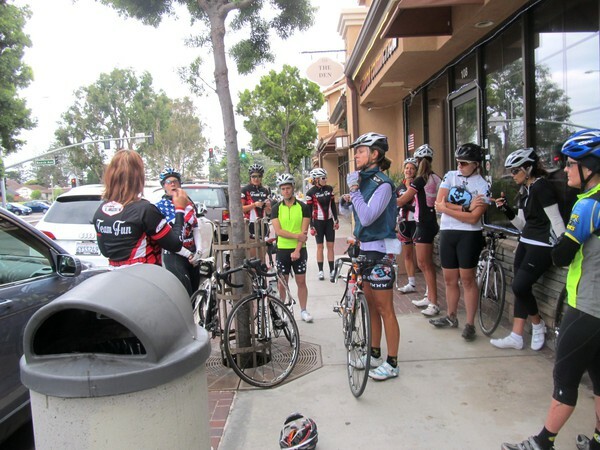 As we do prior to each of our weekend rides, we did a little safety briefing and description of our riding groups (for more information, read this). Decisions, decisions – which group should I ride with today? Usually our routes have a good deal of overlap, and our leaders will let you know where good spots to drop back might be if you are needing to slow the pace a little. On the ride over that morning with Heather K., my legs were asking me why I was no longer in bed, and strangely, yet again straddling this black bicycle. The Tour of Julian had taken quite a bit out of me the previous day, and I wasn’t exactly sure where my energy would come from. I was thrilled to see the large number of women gathered at the shop waiting to ride. I still wasn’t sure where my energy would come from, but was certainly grateful that Carbon Connection provided us with some Honey Stinger gels for the ride. Turns out, we’d definitely need them. 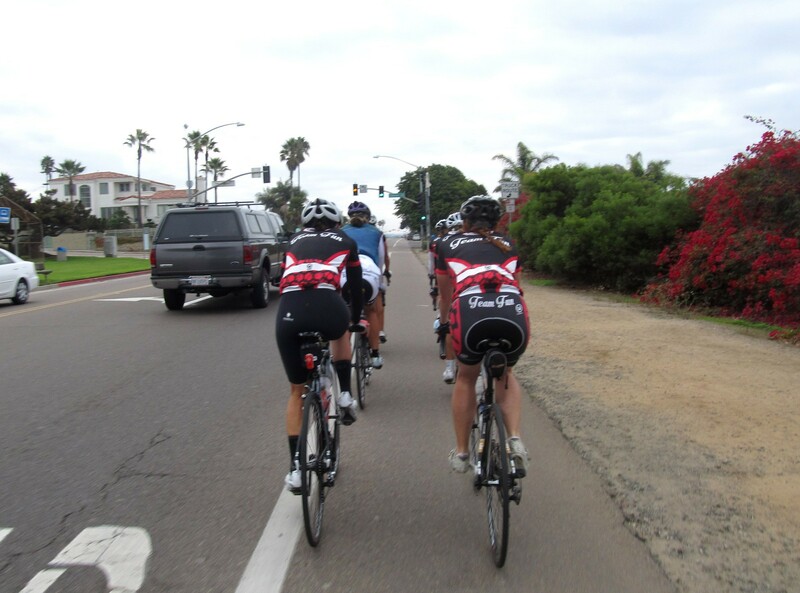 The ride down the coast started out steady and brisk, and with an annoying south wind to contend with, we rotated through the ladies on the front. Photo courtesy of Michell. Loving the pack. 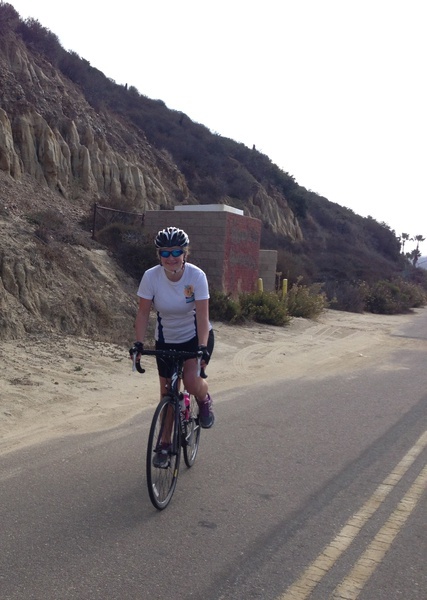 Continuing south, the pace became steadier and brisker, and when we slowed for a light in Solana Beach, amidst the heavy breathing of my compatriots, I suggested perhaps we take the pace down a notch. No one ever believes me when I say that. Team Fun breezes through Cardiff. 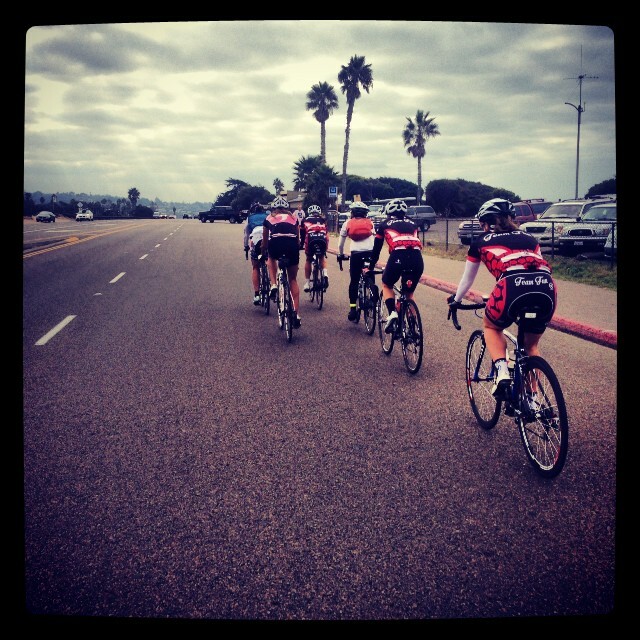 Team Fun in Del Mar, showing off their rule-following style. It’s probably because I never quite manage to take it down that notch until I really desperately need to. We took our left on Carmel Valley and did in fact slow quite a bit due to the overwhelming beach traffic heading to Torrey Pines Beach. We were saving up for the open road of the 56 Bike Path where we could really let off some steam. Our first planned stop was at the gas station at Camino Del Sur. By the time I crested the last hill near the stop, I had completely run out of gas and spun it out to the end. I am not sure about the rest of you, but my memory of how I felt at this point consists of a single image: firm hands wringing out a dishcloth. I also don’t know how much the rest of you were looking forward to that stop to refuel, but I sure was. It seemed like that one little Honey Stinger wasn’t going to be enough – perhaps an entire sleeve of Oreos should have been in my future. Heather K nonchalantly working out Heather Bro’s neck issues. Nothing like a little rest stop massage. With just a short break, we were back at it – wringing out the dishcloth in the other direction on the rolling hills of Santaluz, Fairbanks Ranch, and Rancho Santa Fe. I think I may have again claimed we’d be taking it back a notch, and I think everyone was still wondering when that would happen when we were rolling through the final lights in Carlsbad. With a sweet average up around 18 mph, the ride definitely deserved the title of “Hammerfest”. Where did my energy come from? From the power of the group, of course! Rolling through Rancho Santa Fe. 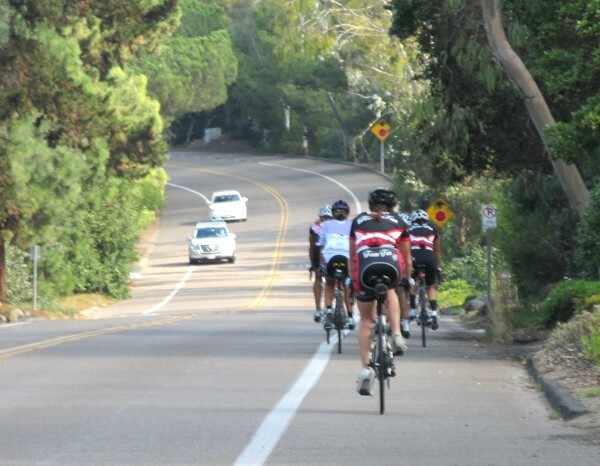 The Intermediate group had been slated to turn around at Carmel Mountain Road, but instead decided to add the challenge of Torrey Pines in the middle of the ride. 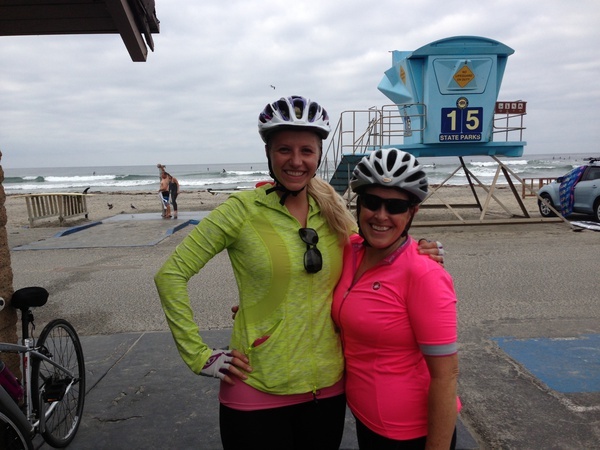 With Christa as their intrepid leader, the Beginner group headed south for an out-and-back ride along the coast. Sian near the turn around point on the Sorrento Road Connector path. Taking a break at the beach. As always, for those that have the time, we enjoy our coffee and snacks at It’s a Grind. This week I enjoyed a pumpkin pie bar along with an almond milk latte. 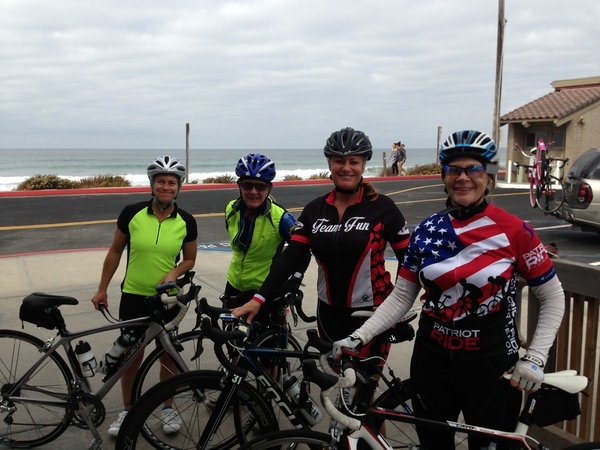 We hope you can join us next week for our scenic out-and-back ride north through Camp Pendleton to San Onofre. Heather describes what delicious treat she is about to devour. The advanced ride was awesome! I had so much fun! I love a good hammer-fest! Thank you for such a great ride!